Is Melbourne about to kill car share? A GreenShareCar car in inner-city Melbourne. A City of Melbourne committee has recommended a plan to rapidly increase the number of car share spaces from 250 to 2000 by 2021, but car share companies have labelled the recommendations “absurd”, warning that instead of growing the market they will force up prices and lead to a contraction. Under a new policy endorsed by the council’s Future Melbourne Committee on Tuesday night, car share companies would have to pay up to $3000 a year for on-street parking spaces. Any new on-street parking would also be contingent on finding two off-street parks in privately owned car parks, or in commercial or residential buildings – at costs estimated to be around $4500 a year a space. The crux of the matter is around parking revenue the City is foregoing (up to $5400 a space a year in the CBD grid) compared to the benefits accrued from car share spaces. An independent report submitted to the council, however, found these benefits were not immaterial, outweighing costs by a factor of 3.4. The report to the City of Melbourne in June by Phillip Boyle and Associates found that the current public and private benefits of the City’s car share fleet of 245 vehicles was greater than $13 million a year. Benefits to the city included increased liveability through reduced cars and reduced vehicle kilometres travelled, leading to reduced congestion, making parking easier to find and cheaper, enabling the city to make better use of built and open space, increasing public health and improving household and local economies. “The consultant’s review estimated that each new car share vehicle results in residents/workers disposing of 10 privately owned vehicles (a net reduction of nine vehicles),” Geoff Robinson, the City’s manager engineering services, told the committee on Tuesday night. The scheme was estimated to cost the City $3.8 million a year, resulting in a net benefit of around $9 million a year. The report found that even using a high figure of $15,000 a year foregone revenue for each on-street car share space, there would still be a net benefit for each car of $38,000 a year – a $3.40 benefit for each $1 spent or foregone in revenue. It said car share was “the single most effective way of reducing the future residential vehicle fleet and vehicle kilometres travelled in private cars” – a major concern for the City as one of the fastest-growing residential areas in Australia. So why the decision to charge? Without charging for parking spaces, the council is set to lose close to $600,000 a year by the end of 2021 in foregone revenue, up from $230,000 now lost. While the partial cost recovery position recommended would still result in losses for the City, these would be substantially less. There are 21 spaces in the Hoddle grid (in the inner CBD) that are currently charged at $3000 a year, so car share companies already have experience in this regard (as well as experience negotiating off-street parking arrangements), however the plan is to charge up to $2000 a year for CBD space outside the grid that currently goes uncharged, and up to $200 for non-CBD space. Indeed, the argument from many councillors at the meeting was around why the City should be subsiding what was essentially a commercial enterprise. “I don’t know why we would go out of our way to cut our own bottom line so much as to support a profit-making commercial enterprise to the extent being suggested [by car share operators]…” Councillor Richard Foster said. “It’s not about not supporting car share. It’s about at what level are we prepared to subsidise it,” Lord Mayor Robert Doyle said. However, car share companies remain adamant the move to charge would contract the industry (a claim supported by the independent modelling), making it impossible to hit the 2000-space target. GoGet chief executive Tristan Sender told The Fifth Estate the City was on the verge of making a terrible mistake. “By charging and pushing car share off-street, they will reverse the growth of car share and penalise residents,” he said. “They are even proposing to charge car share in areas where parking is free. He said the company would have been happy to continue to pay for parks within the Hoddle grid, while maintaining free parking outside this space, though that wasn’t put on the table as an option. Representatives from the three car share companies – GoGet, Flexicar and GreenShareCar – also argued that car share was essentially public transport, a point made in the council’s own Transport Strategy 2012. This form of transport, the independent report said, was in general exempt from fees and charges. “Rail and tramway operators do not pay rates to Council for the land their tracks occupy nor does the taxi industry compensate Council for the lost revenue from parking metres that could otherwise be installed in taxi parking zones,” it said. In a statement made to the committee, GreenShareCar’s Sahil Bhasin said that each time the city invested in bike lanes, bus lanes and taxi ranks it absorbed the costs. “Car share is a new and innovative way of public transport and we ask that the same admiration be applied,” Mr Bhasin said. GoGet general manager Justin Passaportis said the independent report found that 2000 car share spaces would lead to $45 million of annual benefits, though these benefit were contingent on a no-charge policy. Even at a modest charge of $1000 a year for car spaces outside the inner-CBD, a reduction in car share membership of 2-3 per cent was expected, as well as a reduction of the number of vehicles. Flexicar’s Greg Giraud went further, saying the idea that car share should pay for the City’s foregone parking revenue was “absurd”. “We need to remember why the City of Melbourne supports car share in the first place,” Mr Giraud said. Quoting Melbourne Lord Mayor Robert Doyle, he said “no great city in the world is trying to bring cars into the city’s centre”, reiterating the report’s statement that car share was the most effective way of reducing cars and car use. “We must remember that car share is the cure to the high parking demand and congestion issues the city aims to tackle,” he said, warning that a cost recovery model would put at threat Melbourne’s position as one of the most liveable cities in the world. An additional requirement to find two off-street parks for each on-street park was similarly panned by the car share operators. Mr Giraud called it an “additional hidden fee” unrealistic with the financial realities of car share services, while Mr Passaportis said it would stifle growth. A presentation by Breathe Architecture’s Jeremy McLeod warned against requiring too much off-street parking. Mr McLeod referred to his company’s The Commons and Nightingale projects that removed car parking to reduce apartment costs. “One of the key goals of The Commons was to reduce the apartment costs, so we took out a $750,000 basement… and by doing that we reduced the cost of each apartment by $30,000,” he said. He said putting car share into private buildings was a mistake. “We’re trying to build buildings that don’t have any cars,” he said. Putting car share away from public view would also affect ease of use and visibility of the service. 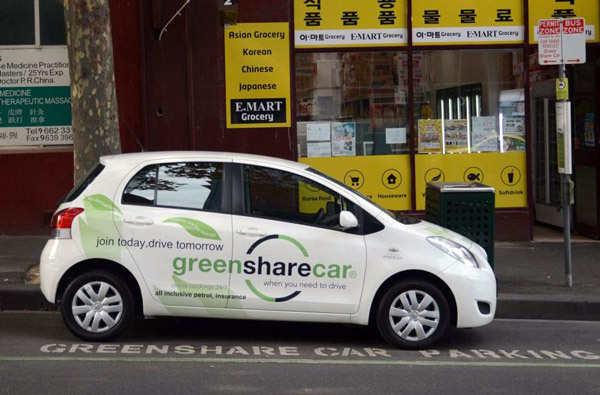 The City of Sydney currently has 800 car shares after implementing a car share policy supported by an independent review that found the economic benefits of car share outweighed costs by a ratio of 19:1. It has a more generous fee structure than the one proposed by Melbourne. “In the City, car share companies currently pay a $2250 establishment cost for each individual on-street car space and must also purchase an annual residential parking permit for each car share vehicle,” a City of Sydney spokeswoman told The Fifth Estate. Residential parking permits currently cost between $26-$103 a year. Mr Sender told The Fifth Estate Sydney’s fee structure had contributed to its impressive car share growth. “The City of Sydney’s policy of not charging operators more than a residential permit has made it one of the most successful car share cities in the world,” he said. 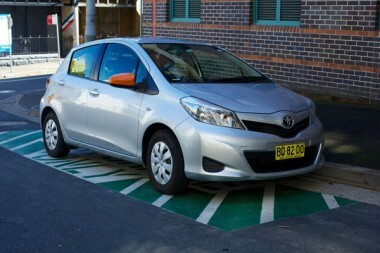 When a councillor asked why Sydney performed better, GreenShareCar’s Sahil Bhasin said Sydney was “more open to accepting car bays and applications”. And so was Port Phillip in Melbourne. He pointed to a poor relationship with the engineering services section that currently held responsibility for car share at City of Melbourne. With this section, Mr Basin said, GreenShareCar had experienced poor service including applications on hold for over six months due to changes in management and people on leave, unanswered emails, and multiple requests for the same email to be resent. He said a branch like sustainability would be better off handling car share, as they would have “a completely different view on the actual tangible outcomes of this service rather than $200,000 being lost in parking revenue”. Despite a majority of speeches to council against charging cost recovery fees, the motion for a partial recovery fee was approved by eight councillors, with only Councillor Stephen Mayne voting against, to demonstrate that changes were needed. Councillor Mayne said the council needed to consider why Melbourne was so far behind Sydney. He warned of the record residential population growth facing Melbourne, and said the council needed to be ahead of the curve in tackling the issue. “I think we need to provide subsidised car share, market much better to the developers, get into the body corporates and owners corporations, advertise this publicly and get a massive take-up,” he said. So is this a case of greedy private rent-seekers trying to maximise profits, or a sincere plea from a fledgling industry trying to stay afloat? Flexicar and GreenShareCar have offered to open their books in confidence to the council to show how the new policy will impact their viability. Whether this is enough to lead to changes will be seen when the full council votes on the proposal in two weeks. If approved the policy could come into effect from September. This is ridiculous, Flexicar was great for us to manage a no car household to a single car household to use the second car as Flexicar. On-street parking revenue in the CBD is a blatant rip off, and lanes dedicated for car parking should be claimed for share use, and bike lanes. City of Melbourne should start charging private operators for their lack of foresight. So disappointing to see Melbourne council once again putting profit before community benefit. Car sharing is a fantastic option, particularly for inner city dwellers — I don’t need a car as I usually walk or take public transport into the city, but there are times when I need to get places and transit isn’t viable. If they are going to push for rapid growth and density within the inner suburbs, they should be supporting services like this that are key for successful high-density populations. Fantastic to see some solid empirical data out there to inform policy in other cities which, hopefully in turn, will release their own data and help refine policy across the country. Much more thought should be given to the relationship between public transport and share cars. Sorry but car share is far too expensive as it stands now – the increase in costs for the operators isn’t going to make it cheaper. It’s sometimes more viable to just rent a car. The council should not subsidise a private enterprise like this. Cars on our roads are a big problem and this doesn’t address inner city congestion. Better public transport does.